"We are proud of this university; and more than that, we are proud of you in Oman and elsewhere." The Department's vision is to bring into view the importance of the university's records and archives as they represent historical legacies, an essential part of the educational process and scientific research in the Sultan Qaboos University. The department aspires to adopt a system for managing the university's records that shall have a novel and modern concept concerned with records as of their initiation until they become cultural assets that embody the university’s history and achievement. 1. To support the educational and research processes at the university. 2. To develop and upgrade the administrative work. 3. To maintain and secure the records from loss or damage. 4. To organize the current records and maintain fast access. 5. To select systematically the records that are worthy of permanent storage. 6. To collect, arrange, and store the university’s records and archives for the purpose of protecting the national heritage. 7. To provide a memory for the Omani records and archives by using all modern methods. 8. To make good use of archives, encourage scientific research, and intellectual and artistic creativity. - On 12 December 2010 the SQU VC issued the decision no. (790 / 2010) on the establishment of the Department of Records and Archives. - On 28 January 2017 the SQU VC issued the decision no. (51 / 2014) on forming a main committee for following-up the preparation of the privacy records management system at SQU. - On 17 April 2014 the SQU VC issued the decision no. (271 / 2014) on amending the name of the Department of Records and Archives to the Department of Records. - On 17 April 2014 the SQU VC issued the decision no. (272 / 2014) on forming an internal follow-up committee for the preparation of the privacy records at SQU. - On 29 June 2014 the SQU VC issued the decision no. 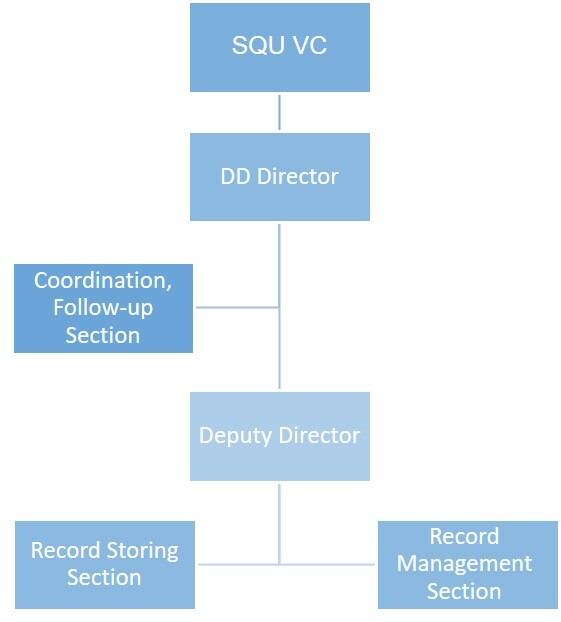 (458 / 2014) on the implementation of the joint record management system at SQU. - On 20 August 2017 the SQU VC issued the decision no. (416 / 2017) on forming an internal follow-up committee for project management of documents and electronic records at SQU. - On 18 December 2017 the SQU VC issued the decision no. (578 / 2017) on approving the organizational structure of the Department of Records. 1. To develop a system for records classification, retention schedule, and the necessary procedural measures to manage them. 2. To carry out postal work. 3. To provide taff with technical support when implementing rules and regulations related to records management. 4. To provide staff with technical assistance in the process of transferring current records to the place where the intermediate records are stored. 5. To manage the intermediate records and make them available to the creating body upon request. 6. To transfer records to the Authority. 7. To destruct records upon the expiry of their statutory retention period as per the rules and regulations in force. 8. To participate in activities organized by the relevant bodies and organizations in Oman and abroad. The Records that are used currently and consistently according to the business requirements. The Records that are no longer considered as Current Records, and used occasionally. The Intermediate Records that are selected for a permanent storage, as they are no longer needed by their creators or receivers who obtain them during conducting their tasks. The Records created by the bodies stipulated in Article (13) herein of the Records and Archives Law. The Records created by persons. The vital records that are strongly required by a body to carry out its tasks, and would be difficult to perform duties without them. The Records which are the same or similar in their type, and deliberated within the concerned bodies. The first version of a record at the time of initiation which contains marks that give its original character such as seal and signature. It would be possible to issue duplicate copies or originals. A group of records created, normally, as a result of carrying out any specific topic or issue within competence. A physical or electronic container to store records and files, also it is called case, in which current, intermediate, or archives are stored. The total number of records, regardless of their form, container, and date that are kept by the originator or the Authority. The organization of records and files into homogeneous parts and categories in according with methods, approaches, and procedural rules followed in this regard. It is necessary to keep them for a period not less than ten years, meanwhile, the secondary version that is in the possession of a beneficiary of a purchase may be dispensed despite being original. The determination of the records that should be stored permanently and records that should be destroyed instantly or at a later date. The final stage of records and files after they are no longer required either by permanent retention by the Authority or destruction. The date of the earliest and last records within a group of relevant records shall be mentioned (such as in a file). Transfer of archives from any originator to the Authority for permanent retention. Administrative form used transferring archives and files from a public facility to the NRAA for permanent retention. The total retention for each record and file in a way that it can be referred to at the most favorable conditions and shall be given a code in the retention schedule (PR). Permanent retention of part of the records after careful sorting followed by destructing the rest. This shall be given a code in the retention schedule (S). Total destruction of the records without retaining any. This shall be given a code in the retention schedule (D).